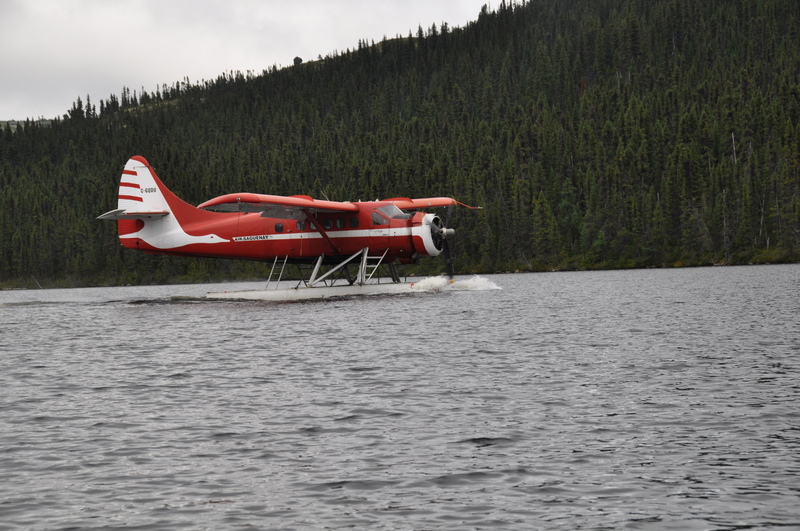 We watched the vintage 1950 Otter float plane lift off the water and loop over us, leaving us with our three canoes and a rainbow assortment of dry bags and paddles tossed ashore in a nondescript shrub and spruce thicket. 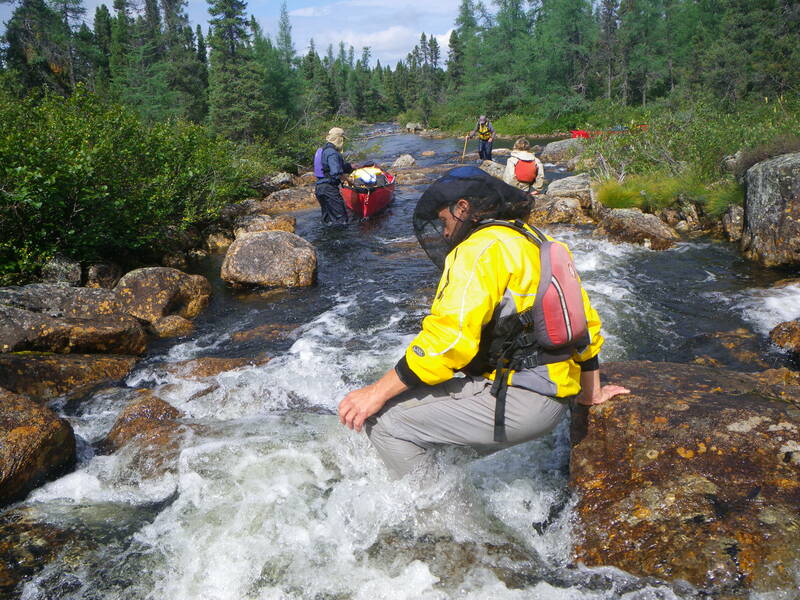 Wearily relieved and anxiously excited at the same time, we listened to the engine hum fade and felt the heavy quiet of the surrounding boreal forest close in…all-too-briefly though as the hum of black flies filled the void, and drove us all-too-quickly into our head nets. 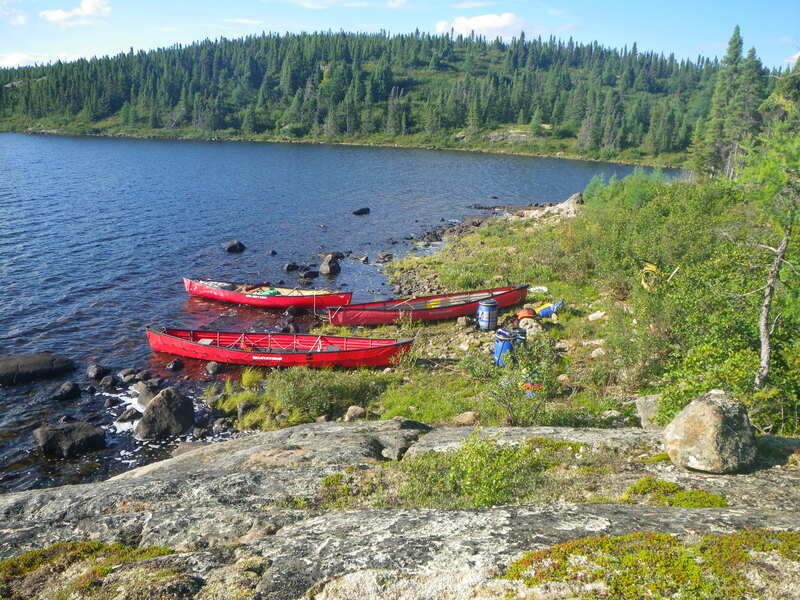 We’d been dropped on Bellinger Lake in southwest Labrador, under an hour’s flight north of Labrador City, for an 11-day late-summer paddle down one of the many rivers that drain east into a very long north-south lake called Menihek. Few paddlers explore this region… a real head-scratcher given the fantastic and relatively accessible adventures that are cued up here. 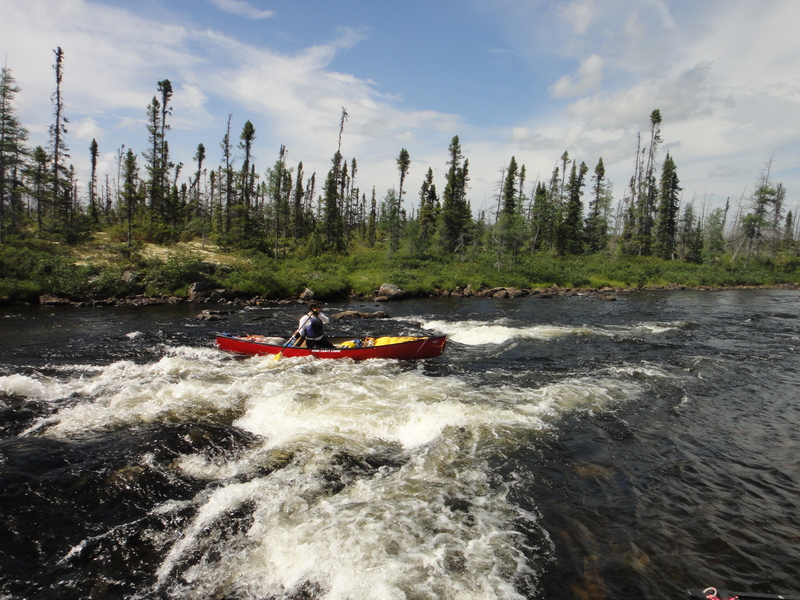 Having paddled the year before on the McPhadyen River, a documented river located a watershed or two to the north that hosts a trip or two a year, we were seeking a bit more mystery…an UN-documented river. We had our eyes set on three possible routes, and decided to make a choice based on what we saw on the fly-in. Several hours before, we’d arrived in Labrador City after a 24-hr drive from Maine to be greeted by a low cloud ceiling and intermittent rain, which teamed to stall our flying plans. Arne, a pilot in our five-member group who’s always ready to entertain with “uplifting” stories of airplane crashes, explained that float planes always needed to keep the horizon in sight…with limited instrumentation on these older planes, flying into a cloud made for the risk of flying into a mountain. The ceiling lingered at that decision “line” – the upper slopes of some ridges and peaks were obscured, but the valleys, lakes, and streams were exposed. After a bit of waffling, Michel, our French-Canadian pilot, committed to giving it a try. We dutifully climbed aboard, the otter roared, and off we went, the wings like cheese cutters shaving slices off cloud bottoms. The tradeoff though, balancing the butterflies in our bellies that all this flight drama stirred, was that by flying extra low we had close-up views of water levels and rapids along our possible routes, making the decision on where to go fairly easy. 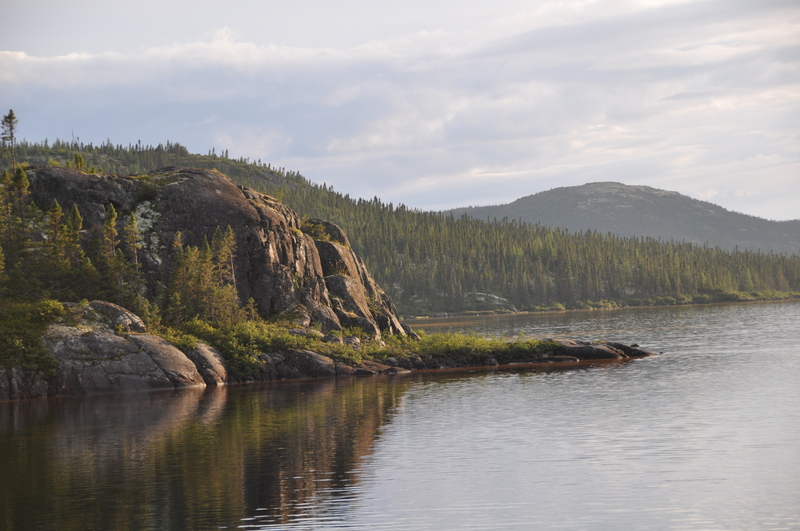 We decided to start at Bellinger Lake, a shallow lake deep in Labrador’s northern boreal forest, lined by string bogs, eskers, low hills, and endless conifer trees, located about 50 miles west of Menihek Lake. Our plan was to paddle out of Bellingers’ unnamed outlet stream, and continue for 11 days through 10 or so named and unnamed lakes, and follow the course of the stream as it grew to full-fledged unnamed river, paddle across Menihek, and catch a train at a small seasonal railroad yard named Esker that would take us south back to Labrador City. It was an undocumented route, in terms of rapids and falls, and we had only low detail topographic maps and low resolution photography to help us plan the trip – essentially the step into the unknown we sought. Bellinger Lake was as far up as we could begin a trip in this watershed; the streams draining into it aren’t really canoeable – in the spring they’re raging torrents, and in the summer they’re shallow braids of water through rocks. We hoped that the large size and amount of water in Bellinger meant that the outlet spilled enough water to make it reasonably passable even in late summer – in fact we were gambling our trip on it. The river winds through bona-fide wilderness. There’s no formal “protected” designation, but the lack of access, the abundant water and harshness of the winters, and most importantly the lack of significant mineral or oil discoveries, have kept human presence to a minimum. Not only were we alone on this river for the entire trip, but the lack of campsites, portage trails, or “canoe-paint” on any in-stream rocks made it feel like no one ever paddled or visited all but the extreme lower portion of the route, and that’s why we had our ticket punched to this station. 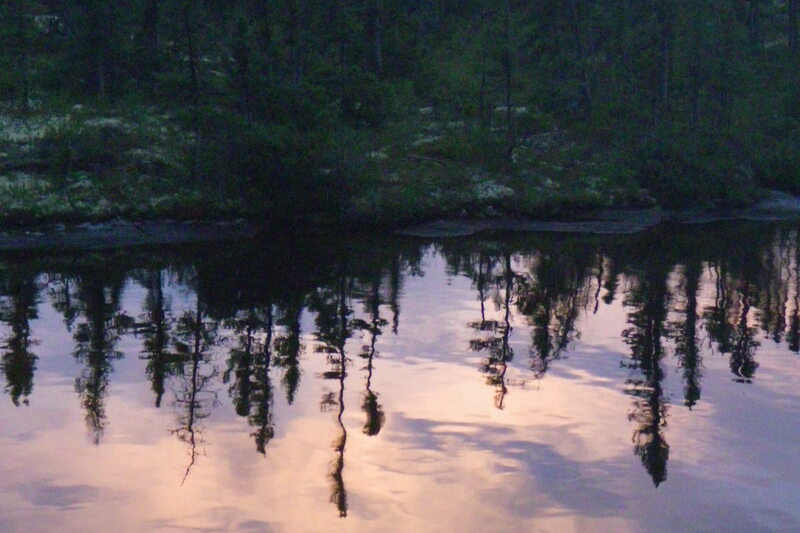 The attraction of a canoe trip in the wilderness of this boreal forest is the promise of journeys of days and weeks encountering no other humans or their signs, during which full immersion in nature gradually chases the stresses and pressures of life in our electronic world. Jets flew high over us, and small planes and helicopters sometimes flew low; reasonable intrusions to the otherwise pristine surrounding. Now, I admit that pristine is an overused and often misapplied term. It’s sometimes used to describe city parks where at least most of the garbage makes it into designated containers, or for beaches where the water is at least usually safe to swim in….as long as you keep it out of your mouth. This river and its neighborhood were the real deal. Lake and river shorelines are ringed by uninterrupted natural ecotones of low shrubby tundra birch and alder easing into gradually taller conifers. Hill sides are blanketed by patchwork quilts of different shades of green. Tops of even small hills mostly are barren (treelines are only a hundred or so feet up the slopes) providing dramatic evidence of glacial scars. Birds are mostly quiet during August in the boreal forest….other than loons that are both common and quick to wail. We saw and heard what we could only describe as “loons barking like dogs” – several large groups of unusually social partying loons. Other than that, an occasional chatty red squirrel seemed to be the only animal willing to reveal itself. But signs betrayed the presence of much more wildlife. The area is prime black bear habitat, and we saw bear tracks and sign everywhere. One sow with cubs actually charged towards us up the opposite shore of the river when we tried to alert her to our presence as we lined our canoes though a shallow rapid. She treed her cubs a mere 75 ft away and we retreated upstream to diffuse the situation… a very cool experience, we all agreed….once it was over. Other obvious signs included caribou trails, which wound their way along most shorelines. The caribou were still north on tundra calving grounds, but soon would be making their way to winter in the spruce groves, which provide shelter from cold winds and plenty of caribou moss and low shrubs to munch on. 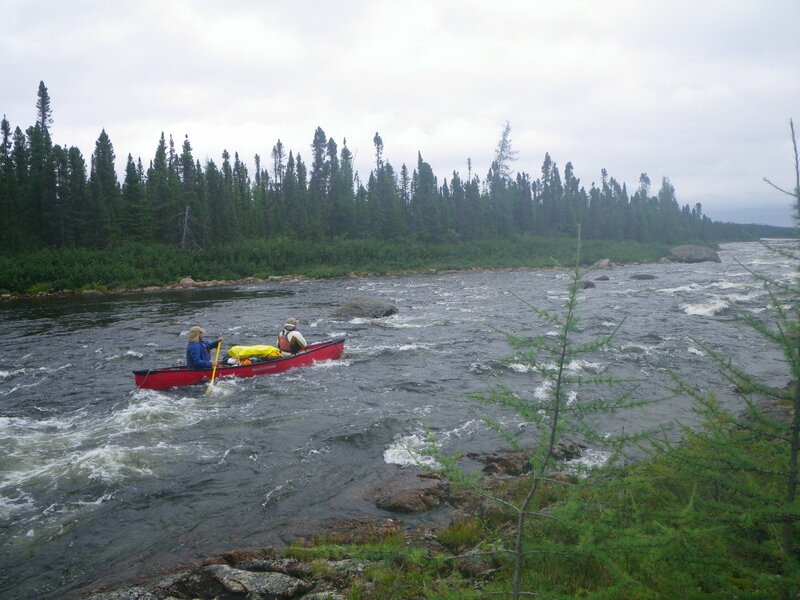 The river itself was truly epic – an alternating mix of flatwater, runnable rapids, challenging lining, and a portage or two around gaping hydraulics. A rapid was situated at every lake entry and exit, and many sections had continuous rips between. 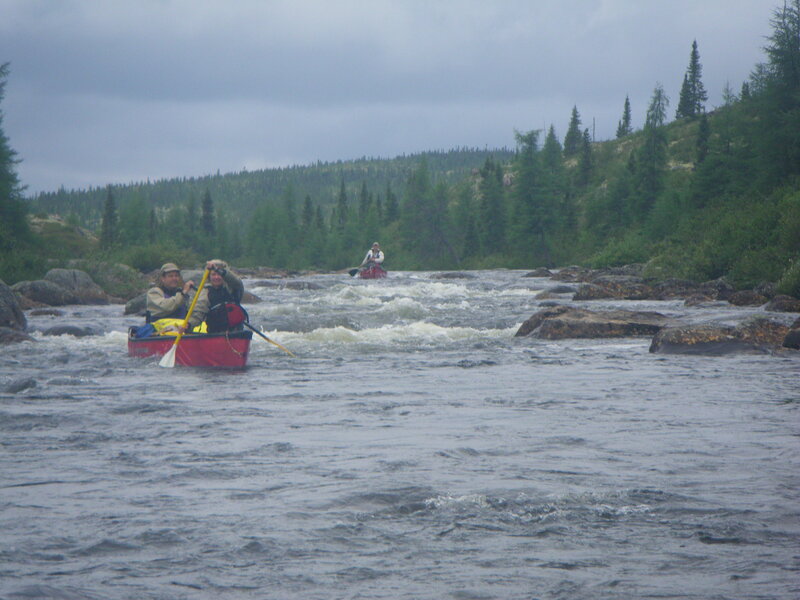 In one section, we had a fantastic mile-long stretch of continuous Class 1 and 2 rapids. We ran one or two of what likely were Class 3 rapids, one accidentally due to an oversight of scouting around a blind bend, but we avoided most of the Class 3 and the one or two Class 4 rapids. For us it was a perfect agenda to accommodate rotating sessions of serious concentration, whooping fun, hard work, and absentminded daydreaming. Your senses, dulled by our modern lives, wake up to the wonders of nature’s subtlety on a trip like this. Humor me while I wax poetically for a bit… In the absence of bird songs, the soundtrack is lazily laced with the gentle sound of the wind passing through the conifers, and the bubbling restlessness of distant rapids. Rain drops coating the spruce boughs become vividly glistening diamonds when the sun peeks out after a rain. The pleasantly pungent smell of the spruce trees wafts intermittently across the water when we paddle, fuels a soothing constant background incense in camp, and nudges you aggressively when you brush up against trees on hikes. 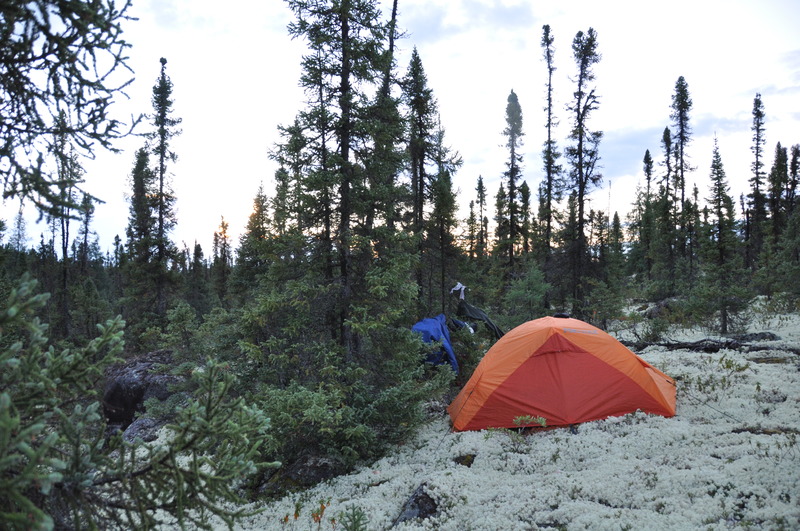 These elements set the stage for one of the real perks of a trip through the boreal forest….laying at night in your tent on a bed of Caribou moss. Each day’s search for campsites is guided by the inviting long distance visible beacons of this moss, which usually indicated slightly higher ground, widely scattered trees, and the promise of great tent sites on six to eight inches of down-pillow like softness. Intent on leaving as little trace of our visit as possible, we were glad to see that one nights camping on the moss left only barely perceptible impressions on the moss. We lucked into a heavy berry crop year, and the tundra and lowbush blueberries were a constant and welcome distraction for the entire group. Lining the canoes through impassable rapids became intermittent efforts interrupted every so often for grazing on what we agreed were the juiciest and most flavorful blueberries anyone ever tasted. 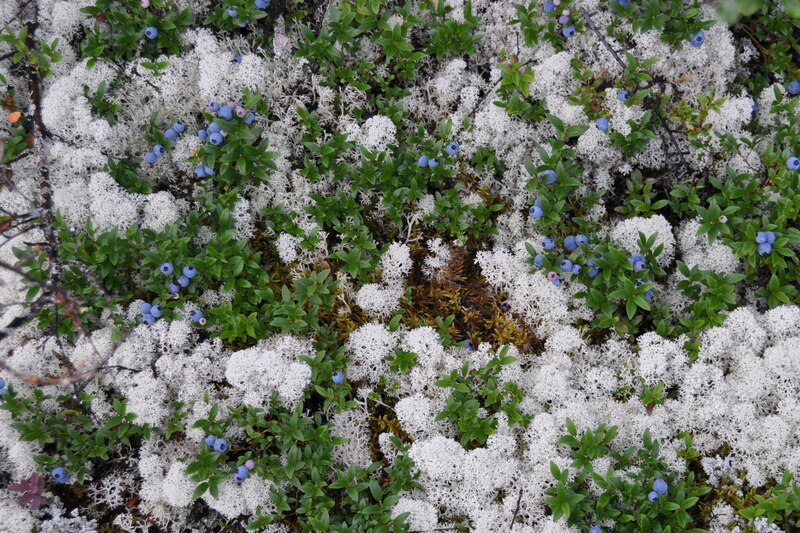 Add to the blueberries the bear berries, mountain cranberries, bunchberries, cloud berries, and more, and the landscape was literally a paint-splashed tapestry of abundance – blue, red, black, and orange all nested in a soft matrix of white caribou moss and green sphagnum. Between mouthfuls, I often would imagine what the landscape would look like two months earlier, when all these berries were an explosion of flowers on the landscape. During our late summer trip, we saw only scattered pale blue of late-season asters, yellow of bog goldenrod, and violet of an occasional fireweed. Fall was knocking on the door. We were confident we nailed the timing of our trip. The river told a story warning that a spring time paddle would have drama and challenges that are best left to imagination. High water would mean way too many unrunnable rapids, impossible lining and wide portaging, and all around life-threatening conditions. The river we paddled often ran in only a portion of its channel, and the car-sized boulders tossed about and razor-scraped barren banks along the shore hinted at a high-water force that must truly be incredible. 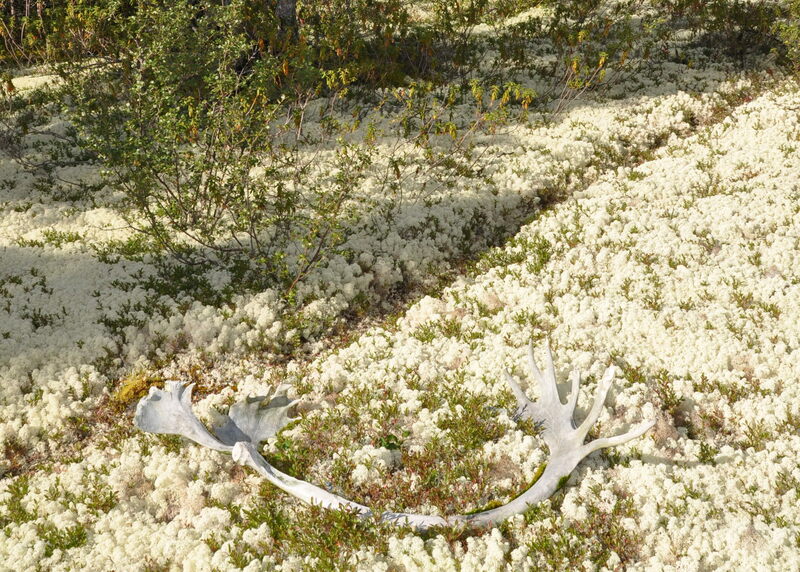 A fall excursion would mean fewer black flies and slightly higher water levels, but by October this land would already be welcoming winters icy grip, and the snow-like ground cover of caribou moss would be replaced by the snow-like cover of…well…snow. Good news! We could ditch the head nets in the rain! We avoided both flood-stage water levels and freezing temperatures by tucking our trip safely into August, but we were dogged by rain every day of our expedition. It had been forecast in the long range, but….. come on….really? Twelve straight days? Moments of fleeting sunshine brought out plenty of healthy sarcasm, but daily rain meant that soaked gear never fully dried, and campfires were hard to start. The rain influenced start and ending times, breaks, and meals. It also prominently figured in our most frustrating day – every trip needs one of those and ours was day two. 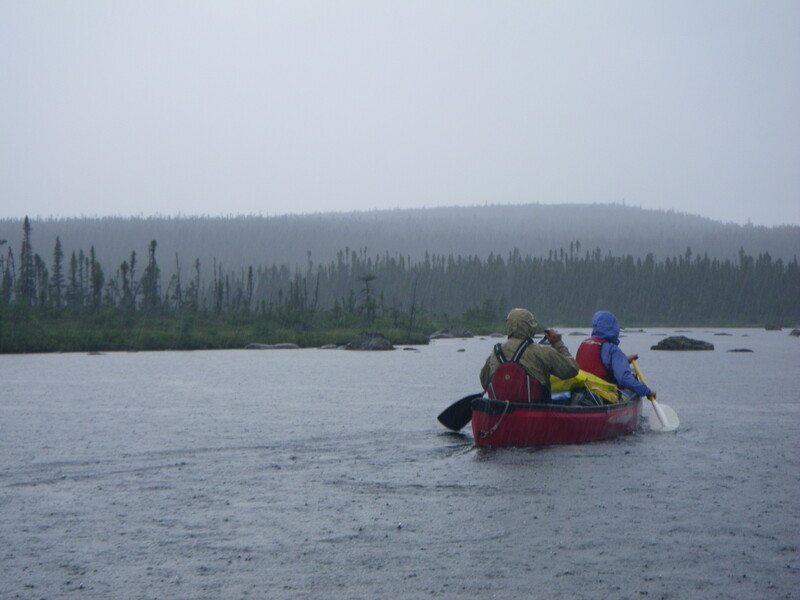 Steady rain, and way too much walking and dragging the canoes through shallow rapids led to a progress of only 5 miles, well below what we needed to average to reach our target in allotted time. But challenges set the stage for successes, and we adjusted our paddling days such that by the latter part of the trip, we were ahead enough to be able to stay in one camp site for two days and hike to the top of a mountain. We fit in two hikes to peaks near the river, and the views from the tops really helped to put things in perspective…. uninterrupted forest, water, and sky in 360 degrees of horizon. The rewards for an easy hike. The boreal forest our river ran through is part of the largest land-based biome, encircling the northern latitudes of the globe. It’s an area dominated by spruce and fir trees that persist through long harsh winters and short growing seasons. The incomparable conservationist John Muir once noted that the coniferous woods of Canada are made up of trees that resemble each other about as nearly as blades of grass, and grow close together in much the same way…I believe his famous gift for describing nature was off the mark in this case. I won’t argue that closer to its southern edge, where the boreal forest borders deciduous forest, the conifer trees are close together and fairly uniform. To the north, however, the trees become stunted and widely spaced, eventually giving way to the treeless tundra. 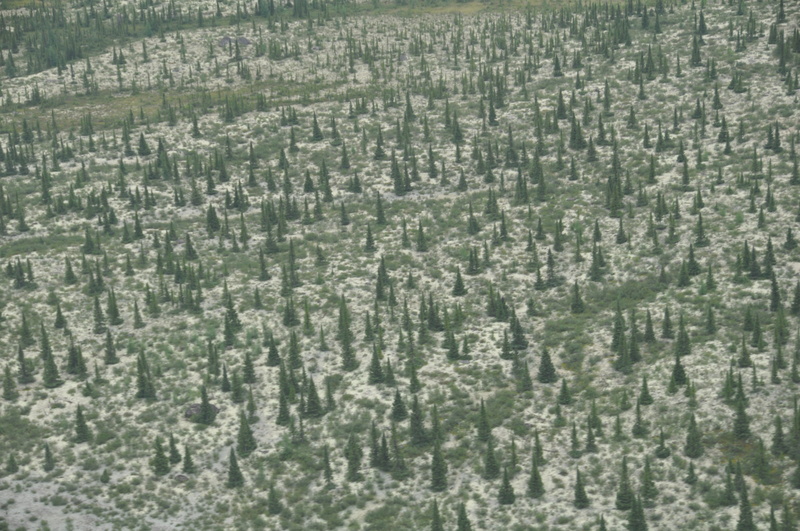 Forest viewed from the plane. It was park-like in the area of our trip – picture a Christmas tree plantation with well-spaced skinny trees about 25 feet tall, with a colorful variety of moss and lichens on the ground between, and plenty of scattered boulders. The harsh exposure to wind and cold, and the shallow and typically damp soils, induce a tortured and craggy appearance of limbs and foliage, and individual expression is the rule. One tree may be missing its middle branches, while a neighbor seems to be balancing all growth in a ball on top of a narrow stick, and another neighbor has a wide belly of growth with a barely visible top and no bottom limbs. 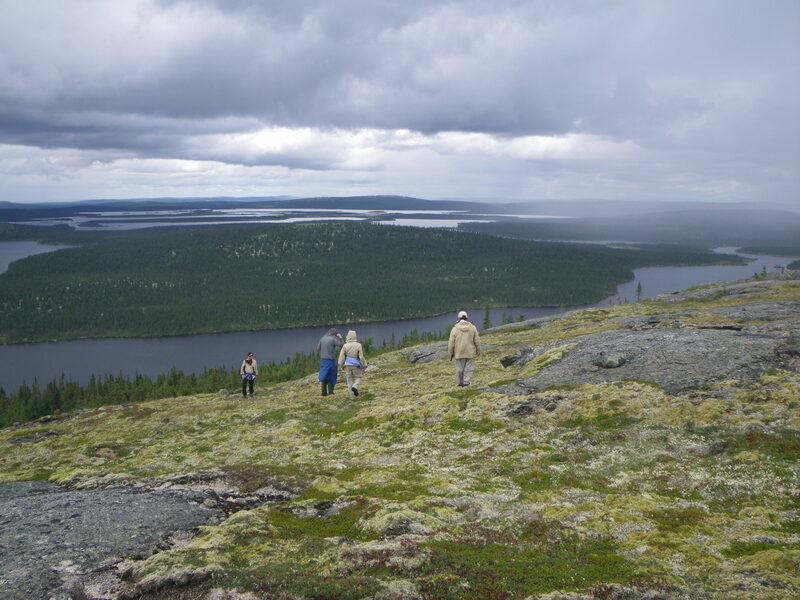 Around the world, boreal forests support vibrant natural communities that are sparsely-populated … by people at least. They provide seasonal habitat for a variety of birds, from tiny boreal chickadees and spruce-fir warblers to the huge great gray owl, but of the 300 or so species of birds that breed here, only about 30 stay through the winter. Large mammals, such as black bear, caribou, moose, and wolves, and small mammals like bog lemmings and red squirrels, find excellent habitat here. 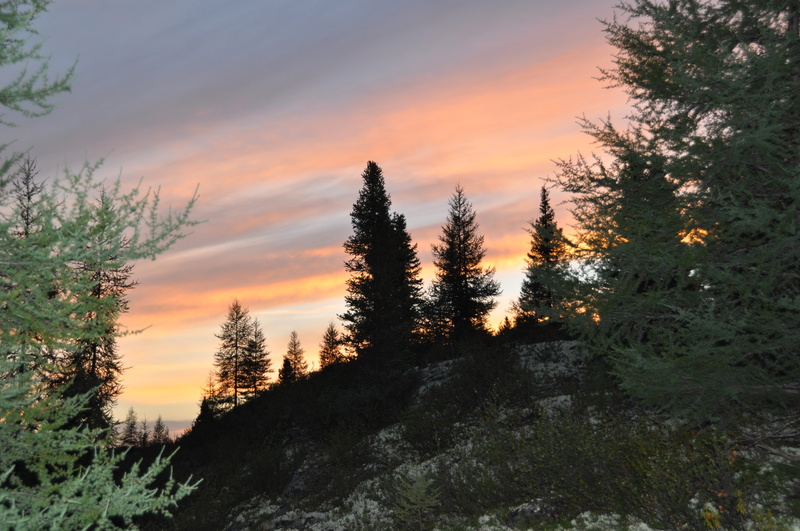 The importance of this habitat is magnified when boreal forest is viewed as one of earths “refuge” habitats compared with much more heavily exploited and developed habitats farther south. With relatively little attention, the boreal forest of North America has been taking its licks. Only 12% of this habitat is protected around the globe, and perhaps because it’s a biome of so few human “backyards”, it’s a biome that’s readily exploitable for its natural resources, and over 30% has been impacted. Its trees feed always-hungry pulp mills, its ground surrenders its oil and minerals, and its shorelines are drowned under hydroelectric impoundments. 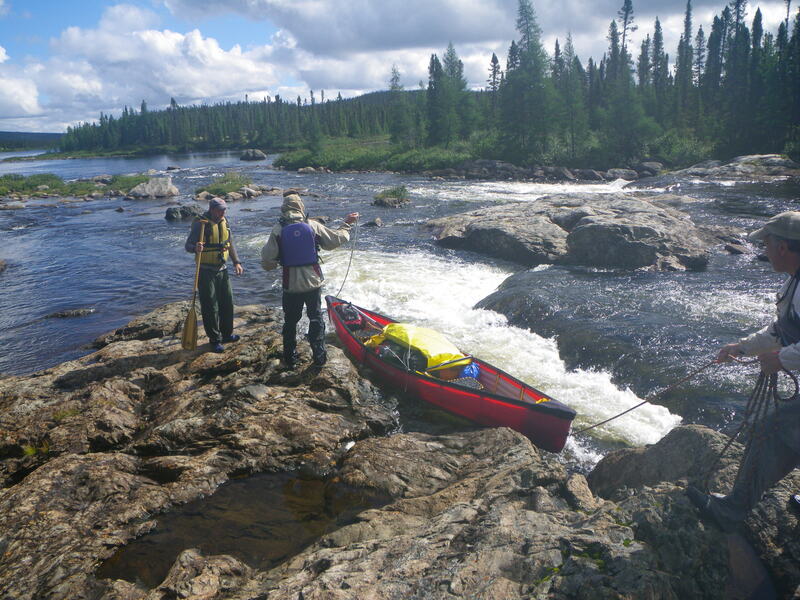 Our canoe route was located on the edge of a 1,000-km long landform known as the Labrador trough, which holds several large and high grade ore deposits. This remote zone has been causing a stir in mining circles lately, and is viewed as a key area in Canada’s desire to become a world player in the iron market. 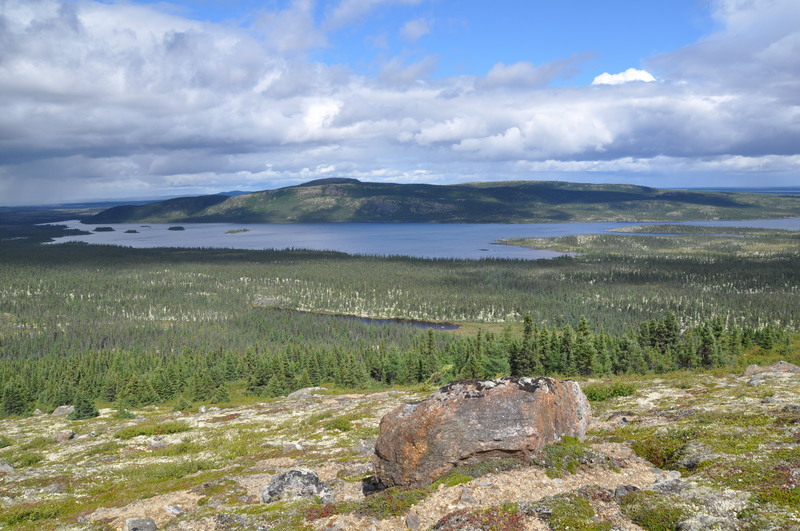 Iron ore extraction is in its relatively early stages here in Labrador and nearby Quebec, but entire mountains have already been ground down. 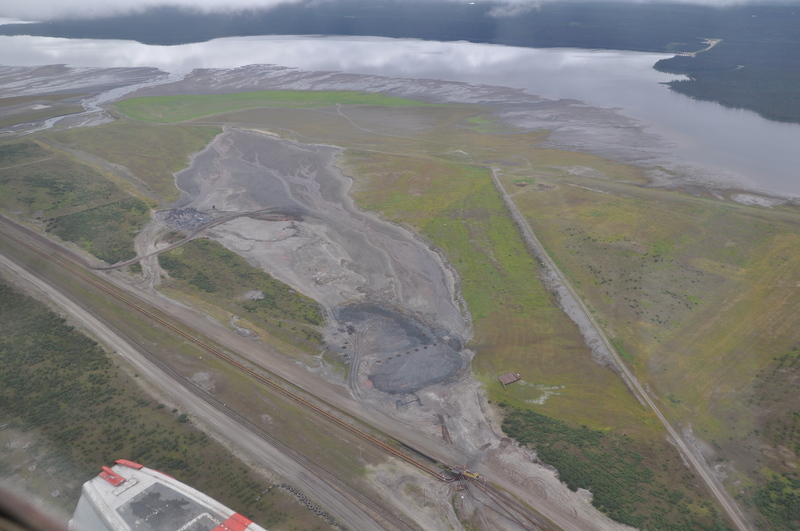 The costs of this development are high and barely mitigated; impacts I witnessed included massive open mines and tailing piles going on for miles, contaminated waterways, and disturbed and eroding ground. 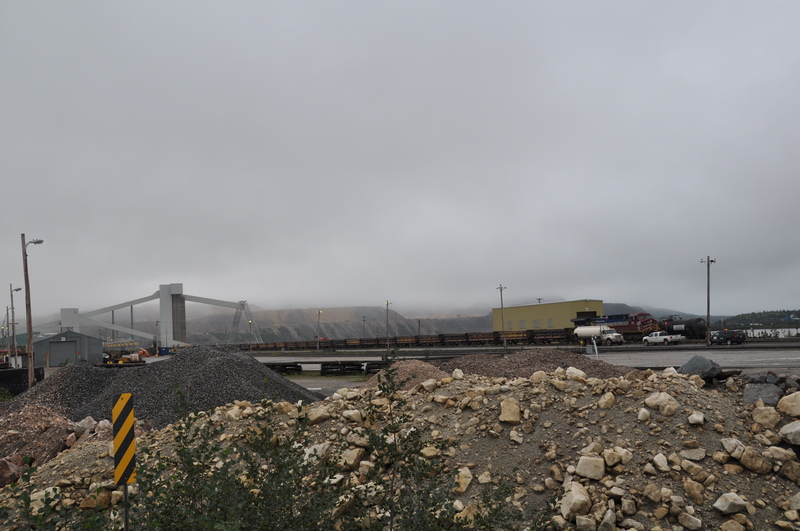 The railroad has been improved, more of the 8-hr road leading to Labrador City is being paved by the minute, and hotel rooms in Labrador City are hard to come by. It’s a boom area. Ore processing, along the Labrador Road. 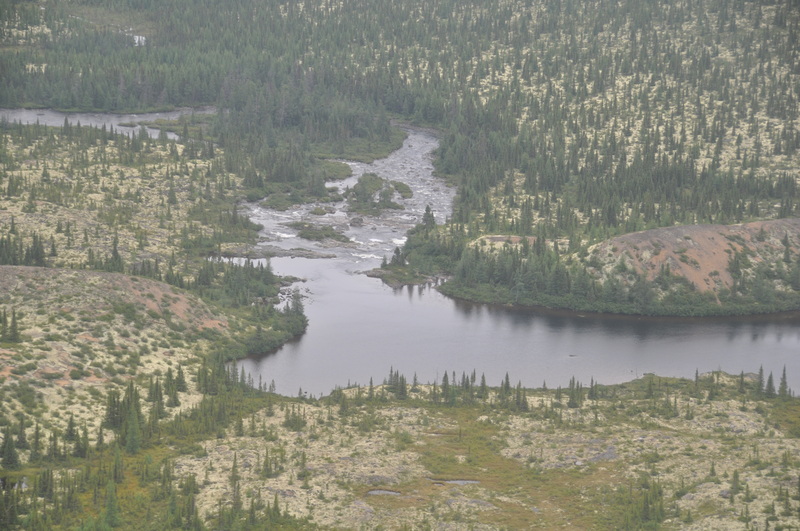 Lake near Labrador City, being filled with mine wastes. 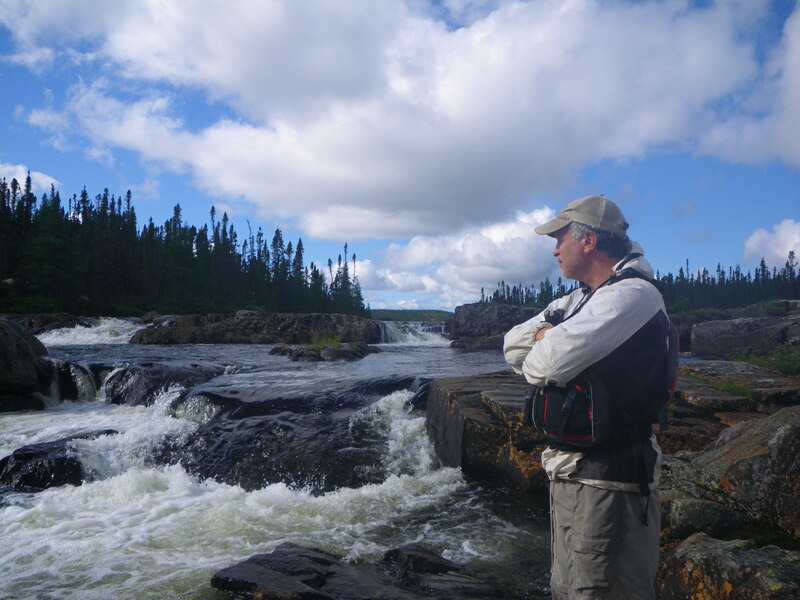 The only evidence of this development potential that we witnessed along our canoe route was low flying planes and helicopters, conducting reconnaissance and testing for minerals. We met two friendly scientists at the end of our trip who thoroughly enjoyed their job flying around in a helicopter, finding the best blueberry patches….and testing for trace indicators of gold in eskers, long mounds of gravel and rocks left behind by waterways inside the guts of glaciers. Development may be on the doorstep of our paddling route, but for now the river has escaped even the minimal attention necessary to warrant giving it a name. While paddling, I thought a great deal about the fact that a river up to a quarter-mile wide, and over 80 miles in length, with raging rapids, pristine lakes, and beautiful vistas, somehow has been overlooked for labeling. That a river such as this has no name on maps or databases seemed to me simultaneously both a crime and a perfect justice. How could a river so awesome not be worthy….it should have a name… right?! Not only would the river be named if it were located further south, but each of its rapids, several world-class level, would have nicknames like devils fury, bus-eater, and froth-in-a-blender. By the time it empties into Menihek Lake, the river is wide and mighty, and huge salmon and trout feast at its mouth. That alone should justify a word on a map! Then again, it may be absolutely perfect that this river has no name. With its rocky shores, moss-covered bluffs and sentry hills, its raucous drops and restless twists and turns, it was the rarest of gems…..an unmarred masterpiece of nature, from its beginning trickle to its final whitewater drop. It seems to me entirely fitting that it be nameless in the wilderness, serving its river function for values and creatures other than human. It’s humans who name, classify, and categorize. This unnamed river, coursing through rugged wilderness, looping the endless soundtrack of water bubbling over shallows, roaring through rapids, and ebbing gently on quiet shores…is most certainly not about humans. It’s a river in wilderness in the 21st century, and that alone makes it a treasure. Lining the canoes in shallow water – the river small. 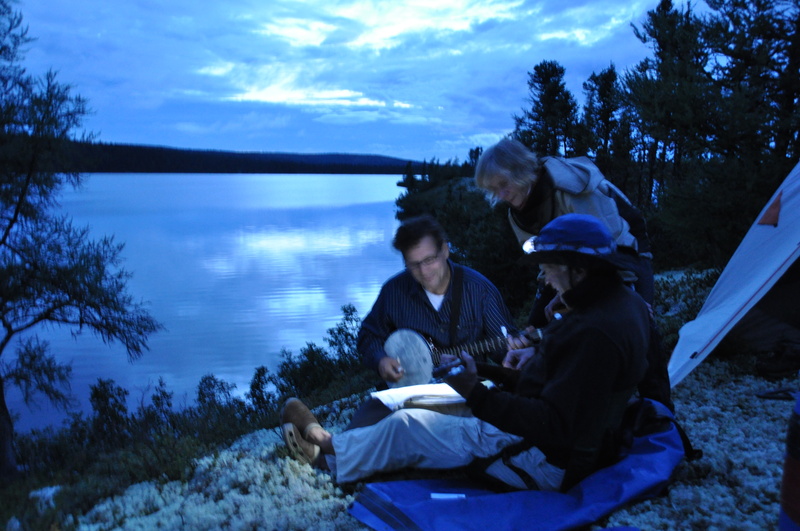 Acoustic night on the esker. Thanks to awesome Ann Tihansky for most of the photo’s!! http://en.wikipedia.org/wiki/Taiga http://en.wikipedia.org/wiki/Boreal_forest_of_Canada http://www.borealbirds.org/forest.shtml http://www.borealbirds.org/factsheets.shtml http://en.wikipedia.org/wiki/Aurora_%28astronomy%29 http://odin.gi.alaska.edu/FAQ/#environment http://www.savebiogems.org/boreal/fastfacts.html (http://www.mining.com/railway-quebec-labrador-to-boost-potential-iron-ore-boom-in-canada-84825/). If you’re interested in paddling the area: From Quebec City, it’s a couple of hours drive to the City of Baie-Comeau along the northern shore of the St. Lawrence River. From there, it’s a long 9 hour drive north on a partly paved, partly dirt road to Labrador City. Plan your fuel accordingly, as there are only several gas stations along the way. Expect a surprising amount of truck traffic…Lab City is a busy place. The friendly folks at Sauguenay Air have the float planes and a great deal of knowledge about the area. North-south passenger trains operate on Tuesdays and Fridays, so you have to plan your finish dates well. Tshiuetin Railway is the name of the train company, and you can actually purchase tickets online. 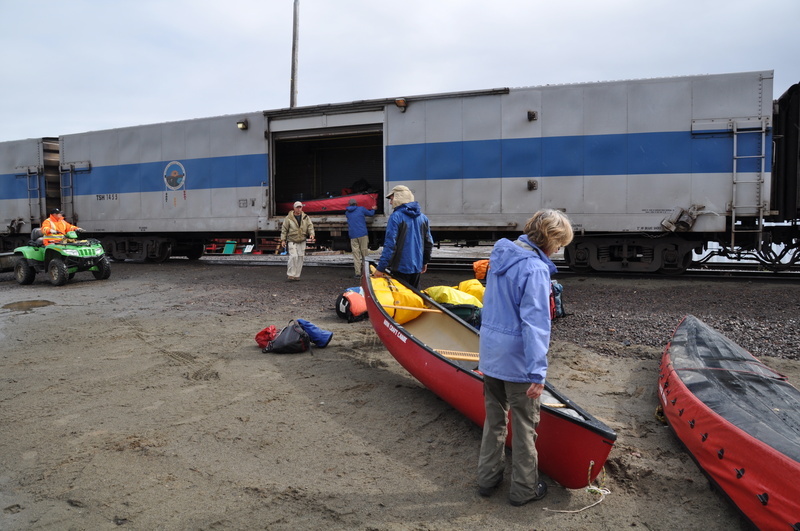 They stop, pile canoes and all gear on the train, and off you go. The workers at the railroad camp seemed to welcome the distraction we provided, and treated us well both years. Again, the area accessible by this “Trains, Planes, and Automobiles” trip is expansive, and wonderfully wild. 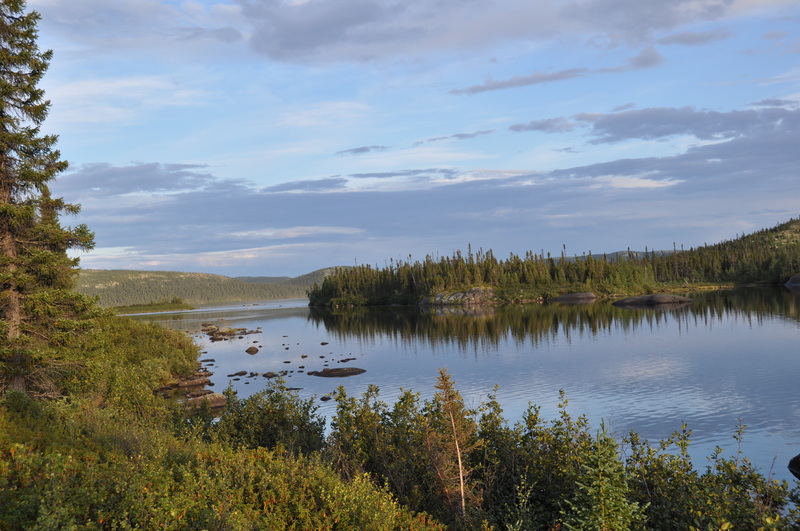 You can find Menihek Lake by finding Labrador City and looking just to the north, and then there are numerous rivers to explore. The north-south rail-line parallels the eastern shore and is convenient for ending a trip almost anywhere…and it really keeps the cost down. 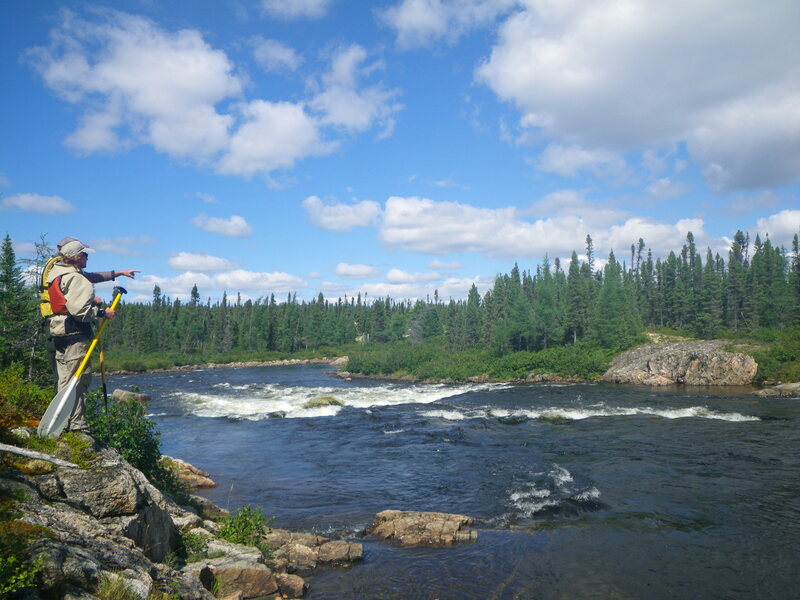 The more significant that recreation usage is, the more it can hold its place at the table in future years as the inexhaustible search for exploitable natural resources marches on in this corner of the boreal forest. Wonderful read. I really felt your affection for the river and the forest lands as I read along. Sounds Like a great trip, nice report. I have been considering doing the same route however and having trouble locating Bellinger Lac. Do you have the coordinates or a more descriptive location? Thanks for giving it a read. One of my paddling companions (the pilot in the article) has all the coordinates, and I think he posted a nuts and bolts overview on one of the paddling sites. I’ll get that and send it to your email address. We’re actually putting together a group to go up there again, this August. Be my third time doing a trip up there. I’ll be in touch via email shortly. How much did the fly-in to Bellinger Lake cost? Thanks. Hi Buck, thanks for your note. Sorry for the delay in responding. The fly in was the most expensive part of the trip. It’s completely based on weight and miles. Plus the rules allow the carrier to put a canoe on only one pontoon at a time. We reduced trips by putting a canoe inside another, and one year we took two pak canoes that we could take inside the plane. Over our three trips up there, I think the range of costs per person for the fly in were between about 400 and 600 dollars. I recommend the trip highly! !